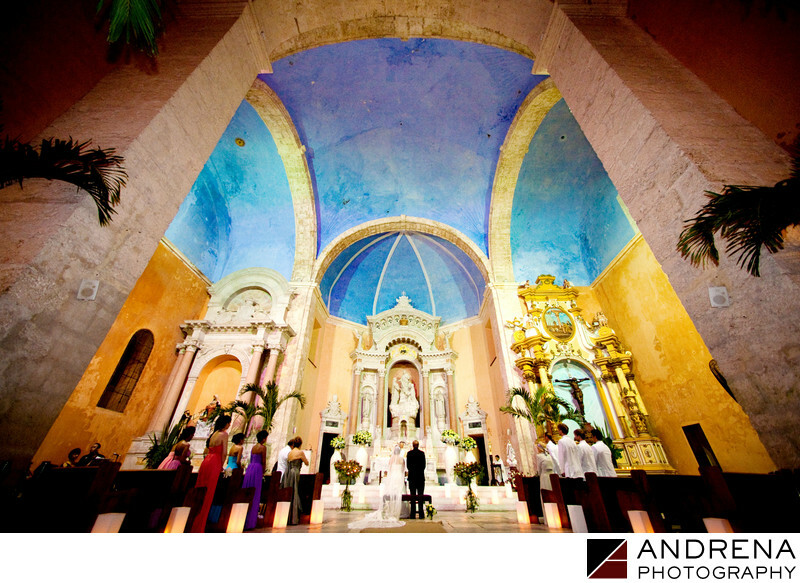 Photographing Catholic weddings in Cartagena, Colombia, provides any photographer with a wealth of photographic opportunities. The old part of the city features numerous old Catholic churches, and one of the most beautiful is Santa Domingo Church, also known as Iglesia de Santo Dominigo. This church was near the end of the 16th century, and it is stunning by any standard. I have been privileged to shoot two weddings at this beautiful church. Its size and scope are truly a sight to behold, as is the stunning color of the front altar. I created this image using a super-wide-angle lens while shooting from a low angle. In this way, I was able to capture the color of the ceiling, which would not otherwise be visible. I love shooting day-after sessions in Cartagena, as the walled city provides color and texture galore. The Knot Weddings picked up this wedding, and it is still featured on their web site. Destination wedding photographed in Cartagena, Colombia, South America.